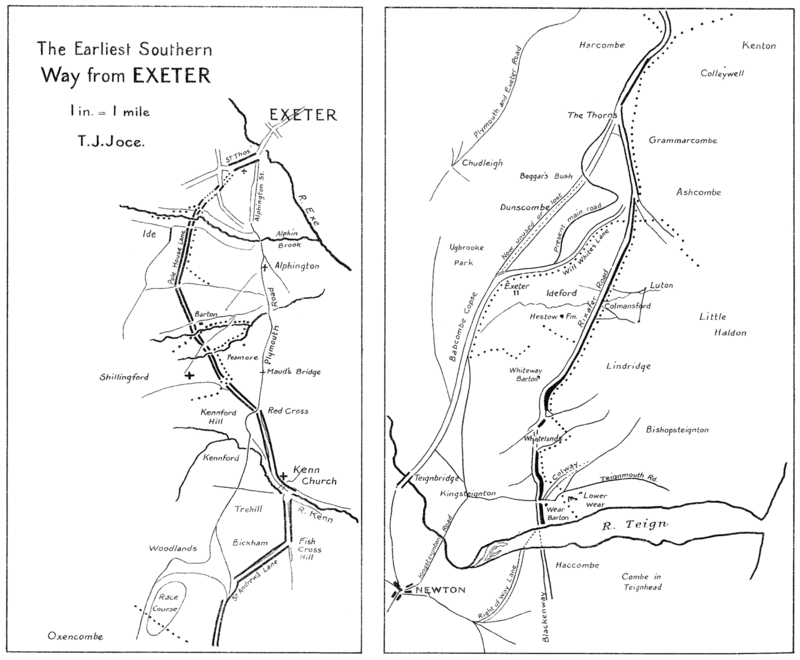 Between the ford of the river by Exeter and the ford at the head of the Teign estuary there would be, without the slightest doubt, a connecting line of travel dating from the earliest times in history, only to be described as pre-Roman. The direction is almost due south. A study of Roque’s Map or Plan of Exeter, 1744, “tres exactement levé et desseinné”, shows the southern course commencing in St. Thomas Street in line with the ford or horsewater and not with the mediæval bridge of 1250. That is, our first piece of road is clearly in line with the early crossing-place on the Exe. This street, for some two hundred yards along by the church, whose yard it bounds on the north, unexpectedly differs from the usual restricted and irregular thoroughfares of old-time cities in that for upwards of ten chains it is perfectly aligned, wide, parallel, and straight. This was not done by a setting-back in order to accommodate increasing traffic, for it was quite away from the city, and is undeniably a surveyor-laid road. Roque marks it “Road to Ide”, but it does not now lead there, although that village was, and still is, reached from it. The existence of this remarkable portion, while both nearer to the river and at the farther end towards Bow Hill the street was narrow, irregular, and unsuited for modern needs, suggests that here is a length of street dating from the days of the Roman occupation when the approaches to the town were under ordered control. This idea is the more feasible as three ancient travel-routes converged on this street towards the Exe crossing, from west, south-west and south, and on the alluvial and marshy land a properly-laid thoroughfare would be a necessity which would not escape the notice of the practical-minded conquerors. At the western end of St. Thomas or Cowick Street the era of the turnpike road and stage coach brought about much alteration of streets and demolition of projecting or decrepit buildings, the record of which may be read there to-day on the neat houses which bear the cheerful if unromantic name Improvement Place. But the strange double-headed cross on the south-east side of the street close to the dwellings marks the converging-point of the old routes. A causeway across Cowick Fields was broken up. “It probably led to Ide”, says Jas. Davidson in 1861, who considered it Roman work. The same writer had witnessed the Roman road-bed on Moorcox Hill in the east of the county being destroyed by road-makers, and his opinion is of great weight. This indication of direction on the part of a painstaking antiquary is valuable as a start. There is but one part of Cowick Fields where that causeway would lie. An apparently needless, angular, and straight-sided turn in the lane between Cowick Street and Alphington Cowick Lane must next be noted. It points across the hilly ground lying between Crossmead and Alphington, and is in line with another sharp, angular turn in the narrow lane leading along that hill to Crossmead, an abrupt divergence from the course of the lane for a few yards. These together continue a line of path by Underwood, straight across the meadow to the Alphin Brook, where the Ide–Alphington boundary, having come along by the stream, makes a right angle to cross the bridge with us. This is the first boundary-point upon our way. Straight forward is the direction, a narrowed road so far as the Ide–Alphington Lane, then at once much wider, the long, even rise of Pole House Lane lies directly in front, the boundary with us still for three-quarters of a mile. At the hilltop the road shrinks to a footpath and cart-track; but continuing in the same straight line, at one place a notch in it, as though the accustomed track had once changed, and crossed from one side to the other of a broad, open course. In the rich, red land here horse traffic has worn a deep hollow until the underlying rock was reached. After passing through Barton, a large farmstead near Lower Shillingford, the cart-way crosses the rivulet rising near Bowhay Farm, and the Shillingford–Exminster boundary comes to the same place, then descends the rivulet and returns up another to a point on our way where it makes a right-angle turn to go with us, our second and third boundary-points. We are now on a footpath and immediately after are on the rise of Sampson’s Hill, where the path widens with evidence of road-metalling for two hundred yards. Two roads shown here on the Ordnance Survey of 1809 have entirely disappeared by the time of the Ordnance Survey of 1909. The boundary leaves us, and we are confronted by a stile, and thence a footpath brings us into the lane leading to Red Cross at the top of Kennford Hill. The evidence of the narrowing of this old road is clear. Its generous width appeared to owner and farmer as a sad waste of rich land, so the road bounds were carried forward, so as to leave only about thirteen feet space along the middle. This proceeding obviously left gaps between the end of the hedge dividing the fields and the newly-banked road-bound, so gates were placed to fill the gaps and can be seen by anyone standing on the hedge-top, three gates in line on either side. The whole original line would be from forty-five to fifty feet. At Red Cross the old way we are traversing ends abruptly, the red rock having been cut away to ease the gradient on the main Exeter-Plymouth road at the top of Kennford Hill. In imagination we jump the cutting and find our line continuing, passing the great breccia quarry above Kennford village, then becoming a deep hollow channel quite unused, and again becoming a footpath, slanting down gradually into the Kennford-Kenn valley road. Although in part reduced to a footway across a field, the Ordnance Survey Map, 1809, indicates a road the whole distance. We pass the site of St. John’s Chapel, a wayside chapel, marked now by St. John’s House, and immediately afterwards St. Andrew’s Church, Kenn, with its south door towards our ancient line of travel. The fording-place of the Kenn stream was just below the bridge. It will be noted that Kenn Church, an early ecclesiastical foundation, has its relation to the old way we are tracing, its village, except for a very few houses, lying at a distance, away over the stream. Across the ford, long since forsaken for the nearby bridge, the end of a road of good width awaits us for the long steady climb to the great ridge. In this region of the red earth the road becomes narrowed. The rock is deeply worn. The lane is straight to Fish Cross Hill, known now as Berber Hill, and both names sound strange. A slight bend, and then along a slanting ridge the way reaches Haldon Summit. The part, now disused, above Berber Hill bears the name, not as one might expect, of Kenn Lane, but of St. Andrew’s Lane, that is, not to the village, but past the Church; a small piece of confirmatory evidence. And now, arrived at the 700-ft. contour line, we are joined by the steep road up Telegraph Hill from the main Plymouth road, and our old route has become an important thoroughfare along the narrow strip of level ridge with the deep hollows of Colleywell, Grammarcombe, Ashcombe, and of Harcombe and Dunscombe falling away to east and west. A mile farther on the boundaries of three parishes meet on it – Kenn, Kenton, Chudleigh – our fourth boundary-point, and from it for five miles the old road and boundary are together. On the 1809 map the road is shown at the top of Grammarcombe, but by 1909 the road has disappeared, the gravel and sand having been washed away by cloudbursts and only the parish boundary remains. Dawlish history tells of destructive rainstorms, of which the results can still be seen. While still on the ridge the Ashcombe–Kenton boundary comes up to the track, our fifth boundary-point, not far from The Thorns. Then for half a mile it is the Teignmouth road, and while still above the 700-ft. line four parishes meet on it – Ashcombe, Bishopsteignton, Chudleigh, Ideford, our sixth boundary-point, and here near the lone pine it traverses the open tableland, an unmetalled track of native flints, nature’s impacted surface, virtually deserted, unenclosed, heading due south, a slight ridge on either hand indicating in the heather its original width. From the brow of Haldon it descends to the tilled lands, Ideford and Luton lying away to west and east respectively, the ancient way here called Rixafer Road. A cottage and garden are on the way, the only piece of squatting now visible on the whole route. One of the streams which unite to form the Abbrook is crossed at Colmansford, and then after a short rise a gate stops the way, the boundary alone continuing. Estate management has substituted a parallel track not many yards to the eastward, but the original line is distinguishable in the meadowland keeping its course, a gentle slope between Lindridge and Heston Farm. About three-quarters of a mile below Colmansford three parishes meet on the straight track, here disguised by growth of turf – Ideford, Bishopsteignton, Kingsteignton, our seventh boundary-point. The 1809 map shows a road here where now is but a footpath in the grass. The change was made by the simple expedient of replacing an old, wide gate by a narrow new one. Arrived at the rivulet which rises in the hollow below Whiteway Barton, the old line, in company with the boundary, curves to climb the limestone ridge, Lindridge, taking advantage of a natural hollow on the rocky sides, here again a well-worn track, though now in private hands. Across the level of the ridge-top on grassland to Vaseford Copse corner, certified throughout by the 1809 map, we part company with the boundary which leaves us to make a detour. We continue our line for five furlongs, first along Humber Lane, then through a gate facing us into Whitelands Copse. A gradual descent commences down our last hill, and one cannot but be struck with the intelligent manner in which this ancient line of route chooses its course. On the sloping grassland below Whitelands Copse, three gates in line are passed in turn, and a straight portion of lane awaits us ahead, narrow, indeed, for the full width lies beside us in a warm hollow, a strip of tilled land, now private property, by name Little Nursery. Our boundary joins us again, the eighth point, and in Combesend Lane for a quarter of a mile, by Combesend Wood for a furlong is our company. The track continues in the rough field called Salcombe Wood, a name evidently, like Wear Barton, having reference to the estuary. We pass across the modern Teignmouth highway, and the end of this lonely, almost houseless, road is in sight. There approaches on the east side the ancient Colway from the heights of Little Haldon, and together these old, old ways along one rough and all but impassable lane now reach the margin of the river. Across on the opposite shore two very early lines of travel, one the Blackenway from the south of the county, the other from much further west, the Right of Way lane near Buckland Barton, not as one road but some distance apart, draw near and come down to the shore at the tidal ford. In process of time the bridging of the river took place at a point about two miles above the ford, though not above tide-reach, and a causeway was formed over the tide-washed land on the south-western side. The ford, with inconveniences and danger, would be forsaken for the more commodious river-crossing with the added advantage of a broad, straight road. This road and the first of all the bridges at Teignbridge certainly are of the same period. In 1815, when the present bridge was built, there were seen deep in the alluvium “piers of fine white freestone, ashlar laid” (Soc. Antiq., Vol. XIX). Not unlikely the piers were of Beer stone, brought by water to the actual site, and the masonry was evidently done with care. Oaken balks laid on the piers would last for generations. The date of this first construction is not known; but as one of the Hundreds is Teignbridge Hundred it must be early in history, and it may be pointed out that the road is used as a parish boundary for a great distance. The broad, straight road commenced on Haldon plateau at the summit not far from a tumulus, and derelict stretches are there at the present day, and a fine reach a mile long in original width along by the eastern wall of Ugbrooke Park and Babcombe Copse, descending to Sandygate and so on to the river. The evidence for this road and bridge being of Roman date is only circumstantial. In 1815 the lowest of the road surfaces cut through at the bridge was found to be paved. The road is earlier than the partitioning into parishes. It is without a doubt a surveyor’s work, being direct. It is merciless and unreasonable in gradient, and for many centuries until quite recent years way-worn travellers and weary beasts of burden had to toil up from the deep hollow of Dunscombe to the high ground above Beggar’s Bush. These characteristics concerning the bold highway which leaves the more ancient track at the hill-top and strides to the river, the paved road surface, the carefully-laid bridge piers, so deep now in the river drift, the causeway to the hard ground, together indicate a Roman origin. At what point, it may be asked, would the users of the pre-Roman way towards the ford leave it to enter upon the bridge-way ? Naturally the reply would be – Where the new broad way commenced. Not always so, for travellers from Exeter southward, by continuing their course along the old track until the ground falls away after the 700-ft. contour and then descending obliquely to join the bridge-road, entirely avoided the descent into Dunscombe and the subsequent climb. This junction road was remarkably easy, going southward. In the reverse direction, south to north, the gain was not so great, yet even so the use of the junction road was advantageous. That it was in use at an early date is evident from the fact that along it lies the Ideford–Chudleigh boundary from the four-parish point on the great heath. Now known as Will White’s Lane, it joined the broad bridge-road, where now is the milestone, “Eleven from Exeter”. On the southern side of the Teign travellers diverged from the ancient route on Abbotskerwell Hill, which led to the estuary ford, passed over the hill towards Newton into Wolborough Street, passed the Lemon in Back Lane, and so to the more civilized road by Teignbridge. Examination of these fourteen miles between the Exe and Teign impresses one by the persistence of ancient ways, even, it is not too much to say, for twenty centuries.